In a decision released on 27 September 2018, the Fair Work Commission (Commission) has made changes to penalty rates for all retail employees covered by the General Retail Industry Award 2010 (Award). The changes will apply from 1 November 2018. The Commission’s review of the Award has distinguished between the purpose of casual loadings and penalty rates and their decision has been made to ensure that the Award provides a “fair and relevant minimum safety net of terms and conditions”. Going back to fundamentals, the purpose of the casual loading is to compensate casual employees for the fact that they are not entitled to sick leave or annual leave. Whereas penalty rates are intended to compensate employees for the inconvenience associated with working late nights, weekends and at odd hours. The Commissioner has determined that penalty rates should be increased for casual employees in line with the penalty rates received by part- and full-time employees for hours worked after 6pm Monday to Friday and for all hours worked on Saturdays. The rates will be increased over three years as per the table below. 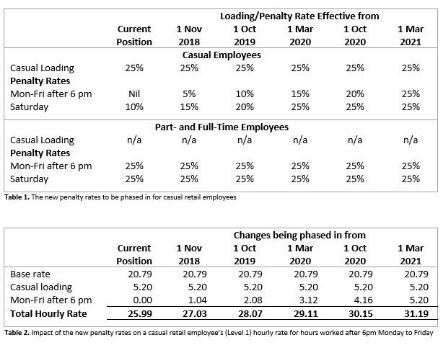 The penalty rates are received in addition to the 25% casual loading and are outlined in Table 1. Table 2 below illustrates the change in the hourly rate for a casual retail employee (Level 1) with the changes to the Mon-Fri after 6pm penalty rate. In the same decision, the Commissioner has also decreased the penalty rates for shift workers. Sunday penalty rates will still undergo the staged reduction as per the Productivity Commission report into workplace relations from earlier this year. We expect that news of the decision is sure to cause headaches for retail businesses in the lead up to Christmas as the unbudgeted changes hit their bottom line as they scale up their workforce in preparation for the busiest time of year in retail. Furthermore, many small businesses will remain ignorant of the change for some time to come and inadvertently underpay their employees. A number of larger businesses have adopted a 3 year expiry period following the introduction of NSW laws. These include David Jones, Myers, Westfield, Rebel Sport, Coles, and Dymocks. Other retailers have no expiry dates including iTunes, JB Hi-Fi, EB Games, Woolworths and Bunnings. Generous expiry periods are a point of difference when consumers are working out which retailers gift card to purchase. Most businesses have a good understanding of the impact of alcohol, sexual harassment, bullying and anti-social behaviour at Christmas parties. It’s a good time to remind employees that the staff Christmas party is considered to be the workplace and they need to protect the reputation of the company. Gifts for employees need to be kept below $300 per person. The Tax Office consider it to be a minor benefit and as such, exempt from FBT. Gifts above this level are deductible to the business but FBT will apply. If the gift is for a client, gifts are deductible as long as the gift is given by the business with the expectation that the business will benefit (ie. the gift is given with the expectation of generating revenue). Entertaining your clients at Christmas is not tax deductible. So, if you take them out to a nice restaurant, to a show, or any other form of entertainment, then you can’t claim it as a deductible business expense and you can’t claim the GST credits either. Charity gifts are an increasingly popular form of corporate giving. For tax purposes, you can only claim a tax deduction for donations made to deductible gift recipients (DGRs). If you or your client receive anything for the donation, then it’s not tax deductible because you have purchased something rather than made a donation. A 25% rate will apply to BREs from 1 July 2021. In 2015-16, the first year small business entities could access a reduced company tax rate of 28.5%, the maximum franking credit rate for franked dividends remained at 30%. However, from the 2016-17 income year onwards the maximum franking credit rate needs to be determined on a year-by-year basis. In many cases this means that if the company’s tax rate is 27.5% then the maximum franking rate will also be 27.5%. However, this will not always be the case.